It seemed to lessen a bit, but the Halloween spirit has come back to kick me in the eye socket. With a black eye of live, I’m back to rocking Halloween spirit; seems appropriate, being as we’re two days until the big day. I figured to avoid another orbital fracture, I’d give a treat to those of you who keep coming back here. 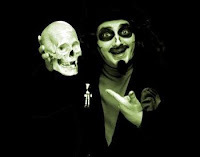 Two years ago, thanks to a random passing-by of an odd YouTube video, I found Svengoolie. Not having the pleasure to grow up in Chicago during the seventies/eighties of the first round, I’m glad that technology allows for access of some of the classic Sven clips. Most of them have left YouTube and gone over to FuzzyMemories, the official home for old Chicago TV. What the above link, the ‘Trick or Link,’ is to a compilation of audio bits taken from Fuzzy Memories. The sound quality is a bit rancid, I’ll admit, but if you are someone who can listen to pops and crackles on a record player, then you won’t mind. 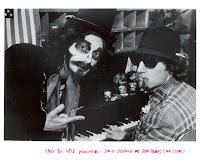 ‘It Came from Berwyn’ features a few songs from the original Svengoolie, since I think they were funny. Hopefully, this won’t be the Mary Jane equivalent of your Halloween downloads; perhaps one of those strange candy skeletons in the oddly colored box, with the candy not tasting all that great but the experience not lessened for it.